Hi, readers! Today's post is a flashback of sorts--an updated version of one of my first, and also one of my most popular. It encompasses one of my freelancing philosophies--that it's more important to pay attention to what you're making per-word than per-hour. Per-word rates are the norm in the freelance world. You may be paid $2/word for a national print magazine, $0.25/word for an online publication, or, say, $200 for a blog post of about 600 words. The per-word figure, multiplied by word count, tells you how much you’ll make for writing a particular article. story. But it may not tell you whether it’s really worth it to take it on. To know the answer to that, you must also consider how much time the piece will take to pitch, research, and write--and possibly rewrite. Divide your assignment fee by the number of hours you put into an assignment, and you'll have its hourly rate. Knowing how much time an article (or any other project, for that matter) will take gives you a concrete idea of the return on your time. Because those $1/word and up assignments can be mighty misleading. Sure, it’s a bigger check than writing for a market that pays a lower per-word rate. But does a higher per-word rate mean you're making more money if you were to write for a market that pays less? Not bad, but here’s the thing—compare that to a 1,000-word piece on the same topic for a smaller magazine that pays only $0.35/word. Yet I know the editor and my query is just a short paragraph. The story requires some background research and several interviews, and takes me a total of five hours to write. (No revisions requested! Yay!) That a total of $350, for five hours’ worth of work—or $70/hour. At first glance, the $1,500 piece appears to be a more lucrative assignment—and it is a bigger check. But my experience has been that national markets (and I’ve written for more than 60 of them during the last 16 years) expect a lot more work from you to earn that higher rate. In many cases, I’ve found that regional magazines, trade publications, custom magazines, and websites pay more per-hour than their national counterparts. And that makes them worthwhile markets, at least for me. Another example? I sell reprints to a variety of markets. No, the rates aren't high--and may be as low as $40/story, but last week I got a request for an article of mine. It took me less than 15 minutes to locate the story on my hard drive and email it to her along with an invoice--an hourly rate of $160. That number puts a new perspective on selling reprints, huh? To know your hourly rate, you have to know how much time each assignment takes, and thats's why I recommend using a time sheet, especially if you're a new writer. As you gain experience, you'll find you can more easily estimate how long a piece will take and have a better feel for what its hourly rate--its true value--will be. **Looking for more advice on writing for money? 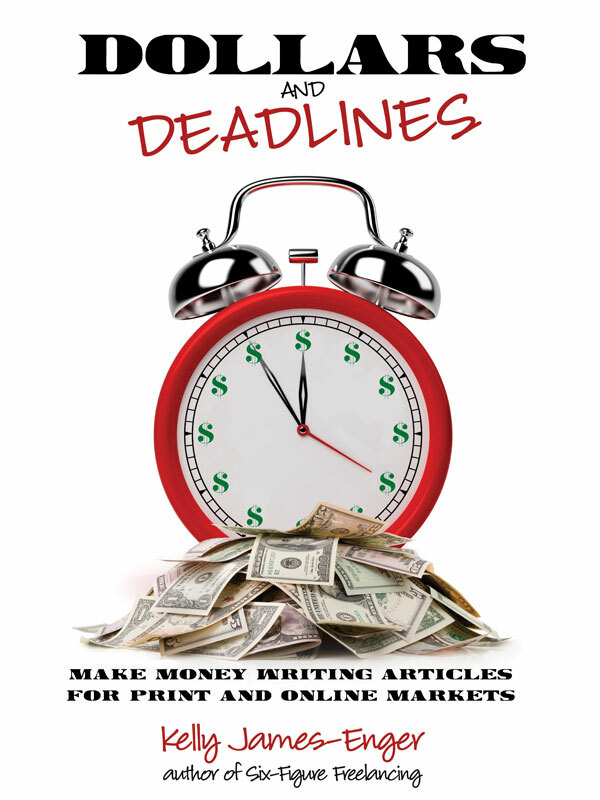 Check out my latest two books, Dollars and Deadlines: Make Money Writing Articles for Print and Online Markets, and Six-Figure Freelancing: The Writer's Guide to Making More Money, Second Edition. You'll save money by buying them direct through www.improvisepress.com, my newly-launched publishing company. Use the discount code, IMPROVISEPRESS (all caps, no breaks) for 20 percent off of your order--and let me know if you'd like a signed copy for yourself or a friend! Q: Tell me a little bit about your writing background. It all traces back to a crazy little road trip I took from Milwaukee to Memphis with a girlfriend in 1997. Bored with my job editing at a railroading magazine, once we were out on the open highway, I mused about how awesome it would be if I became a travel writer and wrote stories about all the places I went. Little did I know that I was planting a seed for my eventual career, only it took me a few years to build up the confidence to pitch editors these tales. Q: How did you get started writing about travel? A: While editing a regional home/garden magazine I learned a few of my freelance writers were also travel writers. One was writing for Budget Travel. She took me under her wing and showed me the ropes -- proof that even editors can use a little help -- and when I left that job I launched back into freelance writing full-time (this was my second go at it). Now that I had a focus, it was very successful and I haven't looked back since. As professional writers it's easy to go after what you think will be profitable but if you don't enjoy it, what is the point? Q: What kids of opportunities are there for travel writers today? either travel websites or magazines' web sites. Think about what you have to offer as a travel writer. What is your passion -- is it museums? restaurants? family travel? romantic vacations? Q: How can writers new to travel get started? cafes in Paris (again, been there, done that) that have a farm-to-table menu (tapping into the locavore trend); or best wineries in Napa Valley that are kid-friendly (wait: people bring kids to the wine country?). Q: How can writers break into this competitive field? pitch doesn't set sail. If you get a response from an editor, even if it's a rejection, be ready to repitch within a week while your name is still on his or her radar. I often start thinking of a second idea even while the first one is under consideration. Q: What will writers learn through your online class? A: I'm a believer in learning from our peers. So while I'm the "teacher" in this class, I'm also facilitating a discussion group. I encourage my students to ask questions of each other and offer moral support. Weekly writing assignments, group discussions based upon a published travel article and Q-and-As I've done with successful travel writers all help students think about what kind of travel writer they'd like to be. Do you want to write articles? essays? a guidebook? I also share a database of 68 (and counting!) paying markets so that nobody has an excuse for not taking the next step: pitching! To sign up for the next class, Flight Plan to Your Travel-Writing Career, visit this link: http://www.kristineahansen.com/classes. Registration deadline is May 1 and the class is limited to just 10 people. **Thanks so much to Kristine for today's blog post! And as I keep telling you, please check out my latest two books, Dollars and Deadlines: Make Money Writing Articles for Print and Online Markets, and Six-Figure Freelancing: The Writer's Guide to Making More Money, Second Edition. You'll save money by buying them direct through www.improvisepress.com, my newly-launched publishing company. Use the discount code, IMPROVISEPRESS (all caps, no breaks) for 20 percent off of your order. Forget Coffee, Try TEA: How to Ask for More Money--and Get it! Hate to negotiate? Scared to ask for more money? You're not alone. I was a lawyer in my former life and it still took me more than 13 months of fulltime freelancing before I summoned up the courage to ask to ask for more money. Now, more than 16 years later, I do it as a matter of course. Thank. Explain. Ask. It's that simple. Forget your regular cup of coffee. Try TEA instead, before you say yes...and let me know what happens! **Hello, readers! I'm happy to report that I've been averaging more than 5,000 hits/month here for the last six months or so. That's awesome! I get lots of emails from people thanking me for my help, and I appreciate that. Now, let me ask for a favor in return--that you consider buying my latest two books, Dollars and Deadlines: Make Money Writing Articles for Print and Online Markets, and Six-Figure Freelancing: The Writer's Guide to Making More Money, Second Edition. You'll save money by buying them direct through www.improvisepress.com, my newly-launched publishing company. Use the discount code, IMPROVISEPRESS (all caps, no breaks) for 20 percent off of your order. Can't afford to buy the books right now? Then request them from your local library! And thank you for your support of Improvise Press, and this blog. You have an idea. Now it’s time to write a query letter, or query. (Remember that query’s a verb, too. You can write a query, or you can query a publication. Both are legit uses of the word.) The query is the way you introduce yourself to an editor. This one-page letter is likely your only opportunity to make a positive first impression, capture her attention with an idea that will work for her readers, and convince her or him to give you your first assignment. It’s important. *The lead. This first paragraph or two should capture the reader’s attention. You don’t need to start your query with an introduction; instead, jump right into your story and write the lead of the article you intend to write. You may use a first-person or third-person anecdote; a recent research breakthrough; a surprising fact; or any other introduction that makes your editor keep reading. *The why-write-it section. This paragraph gives more detail about the article you’re pitching so that the editor can decide whether it’s right for her readers. *The nuts-and-bolts section. This paragraph describes how you’ll approach the article. Who do you plan to interview? How long will the article be? What angle will you use? What’s the working title? I always like to suggest the section of the publication I believe the story belongs here. It shows I’m familiar with the market I’m pitching, which helps set me apart from other writers. *The ISG (for “I’m-So-Great”) paragraph. This is arguably the most important section of the query for an unpublished writer. You’re unknown and unproven, so you want to demonstrate that you’re the perfect person to write this particular story. So when do you send a query? That depends on the publication's “lead time.” Lead time is the amount of time between when a publication assigns stories and when they actually run. Typically, national consumer magazines have the longest lead times—on average, about six months. Smaller magazines and trade publications tend to have shorter lead times, and online publications have the shortest, which may be only a week or two. You want to think about lead time when you’re pitching an idea that has some kind of “time peg,” or reason to run the story at a particular time. For example, you’d probably pitch a holiday-themed story to a national woman’s magazine in early summer, and a “get ready for the beach” workout for a spring issue of a men’s fitness magazine in fall or early winter. The publication’s writers’ guidelines may tell you what its lead time is; if there’s any doubt, it’s always better to pitch a story a little early than too late. In fact, I suggest you always review the market’s writers’ guidelines before you write a query. The guidelines may specify what editors like to see in pitches, and tell you which sections of the publication are written in-house or are otherwise unavailable to freelancers. The guidelines will also tell how to send your query (i.e., via email or regular mail) and may also give you a suggested response time. Here’s an example of a straightforward query using the above template. I’ve included my comments in blue. When I launched my fulltime freelance business on January 1, 1997, I did so without any help. I had no journalism background, no clients, no connections in the publishing world, and a portfolio that contained only two clips. I made every mistake possible along the way. I wrote articles and sent them to markets instead of sending queries. I took what editors offered without asking for more money. I signed all-rights contracts without negotiating to make them more writer-friendly. I wrote for markets once instead of trying to develop long-term relationships. The list goes on…and on…and on. Feel free to use this template and my four-paragraph structure to create your own queries. A model will help you create a compelling, professional query that will help you nab assignments. **Looking to launch your freelance writing career--or make more money for your words? Check out Improvise Press' first two books: Dollars and Deadlines: Make Money Writing Articles for Print and Online Markets, and Six-Figure Freelancing: The Writer's Guide to Making More Money, Second Edition. You can order them through any bricks-and-mortar or online bookstore, or directly through www.improvisepress.com. Use the discount code, IMPROVISEPRESS (all caps, no breaks) for 20 percent off of your order. Can't afford to buy the books right now? Then request them from your local library! And thank you for supporting Improvise Press, and this blog. I'm thrilled to write a guest post for The Renegade Writer today, on a topic of interest to anyone who's been freelancing longer than a year or two. How do you know if it's time to add something new to your work mix--and how do you do it? Check it out! New writers often ask me how to make their queries stand out from the pack, especially when they lack clips. The best way to do so is to craft a compelling query that shows you've already down researched the topic you're pitching. Depending on the topic, this may mean including statistics, recent research, or "live" quotes from an expert or another source. So how much time and effort do you put into the query itself? Do you interview a source before you get the go-ahead to do the actual article? Or do you wait until after you get the assignment? The answer depends on what I call the McCaughey Septuplets Rule. Let me explain. If the story I'm pitching turns on someone's participation (such as with a true-life feature or a profile), I contact the person ahead of time to make sure he or she is willing to do the story if (and hopefully when) I get the assignment. I may also use this opportunity to do a brief interview with my source and include some "live" quotes into the query, demonstrating that I've already done my homework. I call this this "The McCaughey Septuplet Rule." Long before 19 Kids and Counting aired, the McCaughey Septuplets, born in November, 1997, were big, big news. Every few months, their beaming faces would grace a women's magazine. So let's say you wanted to write a profile on the McCaughey septuplets or interview one or more of them for an article. Sure, you can pitch the piece, but if it gets assigned, well, you need the septuplets. No one else will do. Same goes for pitching an article about a particular celebrity. If you want to write about Matt Damon, you'd better confirm with his publicist he's willing to talk to you for the story. And if you plan to write about a researcher's ground-breaking discovery, you want to be sure she's willing to be interviewed for your story. Otherwise you'll be unable to write the promised piece. That's why I confirm that any critical story source is willing to talk to me before I pitch the story—I don't want to be stuck with an assignment I can't deliver. Otherwise, I note a couple of people who I "plan to interview" (note my phrasing--these are the types of sources I plan to talk to--if one isn't available, I'll get someone similar), and contact them once I get the assignment. Get the idea? If the story turns on someone's participation, I get their OK before I pitch it. Otherwise I pitch it and contact my sources afterwards. That's the McCaughey Septuplets Rule, in short. Follow this strategy and you'll write stronger queries--and never be in the position of being unable to deliver a story you pitched. **Want to launch your freelance career--or make more money as a freelancer? Check out Improvise Press' first two books: Dollars and Deadlines: Make Money Writing Articles for Print and Online Markets, and Six-Figure Freelancing: The Writer's Guide to Making More Money, Second Edition. You can order them through any bricks-and-mortar or online bookstore, or directly through www.improvisepress.com. Use the discount code, IMPROVISEPRESS (all caps, no breaks) for 20 percent off of your order--and please let your friends who would like to make money writing know about Improvise Press and our new line of books. When I surveyed freelancers last year about the types of work they were doing, more than three in four said they write for online markets. Yet some writers mistakenly think that there's no money to made writing for the Web, assuming that most online work is for “content mills” that pay a pittance (say, $5 for an article or blog post). Just as you would with a print magazine, analyze your potential market before you query. What types of subject does the site cover? How long are the articles or blog posts? How often are different sections of the site updated? Which sections seem to use the most freelance material? And of course, read the writers' guidelines if they're available online. Rates vary widely, but promising online markets pay anywhere from $50 to about $500 for a blog post of 500-800 words and $0.25 to $1-2/word for articles. If you can't tell what a market pays, don't hesitate to email and ask. Next up, send a query letter or LOI to pitch the online market. Make sure you play up your online writing experience in your pitch. If you have zero e-clips, consider creating a blog to get some practice with the online form as it's a bit different than writing for print. Researching an online piece is no different than researching one for a print market, but there are some significant differences between writing for online versus an online market. In general, online articles tend to be shorter, more timely, and more "chunky" than print stories on the same topic. Online stories tend to include more subheads, bullets, and numbered lists than print articles might, and their visual impact (how they'll appear on the page) should always be kept in mind. Another critical factor is a compelling headline, which draws readers--make it as attention-getting as possible. The same goes with the lead--it should grab readers and make them want to stay on the page. As you’re writing, model your work after the site's style and tone. You may also want to consider including certain SEO, or search engine optimization, words as you're writing. Not every editor expects this, but offering to include SEO keywords in your piece, if desired, may endear you to yours. Just as you would with a print story, turn the piece in on time and with any necessary backup, or fact-checking information. Offer to promote the story through social media when it appears, and answer your editor's questions promptly. And be sure to pitch another idea when your editor lets you know he has approved your piece--it will help you create an ongoing relationship with him. ***Want to launch your freelance career--or make more money as a freelancer? Check out Improvise Press' first two books: Dollars and Deadlines: Make Money Writing Articles for Print and Online Markets, and Six-Figure Freelancing: The Writer's Guide to Making More Money, Second Edition. You can order them through any bricks-and-mortar or online bookstore, or directly through www.improvisepress.com.